Got a new Mac for the holidays? Congratulations! We bet you’re anxious to get started using your new Mac—in fact, you might be reading this on that new Mac right now. The key to getting things done is to have the right software. Your Mac comes with plenty of software to get you started: Mail, Safari, iCal, Address Book, iLife, and more. But where can you find software that’s not already on your Mac? One place—and perhaps the easiest source to use—is Apple’s Mac App Store. 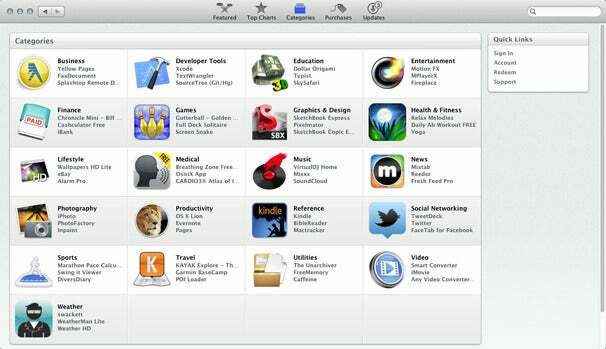 The Mac App Store is filled with thousands of software programs for all different types of people and tasks. You can find recipe databases for the family chef, artistic effect filters for photographers, audio software for musicians and DJs, system utilities for the Mac expert, and upgrades to OS X Lion for your friends. And, of course, there are games, games, and more games. But wait—you say you’ve never bought anything on the Mac App Store? Don’t worry, we’re here to help. In this tutorial, we’ll go through the steps for buying software on the Mac App Store. It’s very easy. Sounds simple enough to start, right? It is, if you are running OS X 10.6.6 or later. If you have a brand new Mac, that includes you, since it’s probably running the latest version of OS X, Lion (10.7). Assuming you've got Lion or the latest version of Snow Leopard installed, you should have the Mac App Store app. Look in your Applications folder, your Dock, or (if you're running Lion) in LaunchPad—it looks like the icon at the top of this article, a blue circle with an A inside. Open the app, and you’re in the store. You need an Apple ID to use the Mac App Store. 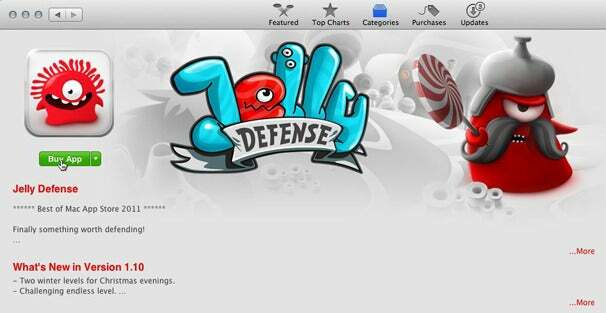 If you’ve shopped at the Mac App Store before, you’re probably still automatically signed in. If not, you need to sign in with your Apple ID. If you've used the iTunes Store before, you can use the same Apple ID. Click the Sign In link in the Quick Links section on the right-hand side of the Mac App Store window. (You don’t need to sign in to browse the contents of the store, so you can wait to perform this step when you’re ready to make a purchase.) A pop-up box will appear and prompt you to sign in with your Apple ID. If you don’t have an Apple ID, click Create Apple ID and create one—you will need to enter credit card information or a PayPal account. There are different sections of the Mac App Store to help you find the right app for your needs. The New and Noteworthy section features apps that have just entered the Mac App Store. The What’s Hot, Top Paid, and Top Free section show which apps are popular at the moment. Apple also has a Staff Favorites section, as well as a Top Grossing section. You can also peruse apps by category, either by clicking on the Categories button at the top of the Mac App Store, or by using the categories pop-up menu in the Quick Links section. The Mac App Store organizes its apps into categories. You can also use the Search field in the upper right. Of course, you can also use the Search field in the upper right corner to find an app based on its name, or to perform a search based on the type of app you are interested in. Found an app you want to buy—or, better yet, a free app you want to try? Great. When you’re ready to buy, look for the price of the app in the upper left corner of the app’s page. The price is actually a button. Click on it, and it changes to a button that reads Buy App. Click the button again to buy the app. If you haven’t signed in, you’ll have to do so at this point. If you don’t have an account, you’ll have to create one to complete the purchase. When you want to buy an app, click it price button. To confirm that you want to buy the app, you need to click the button again when it changes to Buy App. After you’ve purchased the app, the Mac App Store downloads the app and installs it on your computer. (Your credit card or PayPal account will be charged for the purchase.) If you are running Lion, your Mac's screen will switch to Launchpad and you’ll see the new app’s icon at the end of the list as a dimmed icon with a progress bar labeled Downloading. You can do other things while you’re waiting for the app to download; just click any blank space (or press the Escape key) to leave Launchpad. The new app will continue downloading in the background. If you want to check the progress of your download, you can reopen Launchpad, or you can check the Purchases section in the Mac App Store app. In the latter, your new app will be at the top of the list, displaying a progress bar and the amount of time left on the download. Below that app are the other apps you have bought (if any). The Purchases section of the Mac App Store shows the progress of your download. The amount of time it takes to download a new app depends on the size of the app and the speed of your Internet connection. You can pause the download if needed by clicking the Pause button next to it in the Mac App Store's Purchases screen; to resume the download, just come back to the Purchases section and click the same button, which is now labeled Resume. When your new app has finished downloading, it will be listed as Installed in the Purchases section of the Mac App Store, and the app’s icon in Launchpad will no longer be dimmed—the app is ready for you to use. In Launchpad, the Mac App Store will show a red number button when an app update is available.